The queso wasn't a fan favorite, but this new item isn't likely to cause an uproar at Chipotle. The fast-casual burrito joint is testing frozen palomas as a new boozy cocktail offering, according to The Daily Meal. 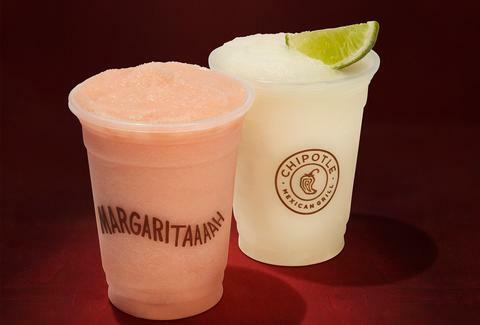 Chipotle is calling it the Frozen Paloma Margarita. So, it's not exactly a traditional paloma but it's no margarita either. It's a margarita-style paloma, maybe. (Palomas are tequila cocktails usually served with some kind of grapefruit soda like grapefruit Jarritos or Fresca.) Chipotle's slushie drink is made with grapefruit, agave nectar, citrus, and Sauza tequila. One 14-ounce plastic cup will run you $6.20. Unfortunately, it's only being dished out at the restaurant's NEXT Kitchen, the brand's public test kitchen in New York. But, according to The Daily Meal, it's worth the trip. It's said to be a little more sugary than a classic paloma, but it's also "tangy and boozy." The reviewer also noted that "she started feeling the buzz after finishing just half the glass (er, plastic cup)." This isn't a wildly new foray for Chipotle. The burrito hub has served frozen margaritas since 2013 and also serves beer. Of course, an appearance in the NEXT Kitchen does not guarantee the drink will hit menus nationwide. However, this seems like a better way to draw in new customers over their lunch hour. At least, it's a better plan than chorizo or gritty queso.